In the urban areas of South Africa there are massive problems of food insecurity and unemployment. Urban farming is increasingly considered to offer a solution to both problems. Urban organic horticulture will lead to a better nutritional situation and will lead to jobs. Additionally it will help green the living environment and contribute to more safety. 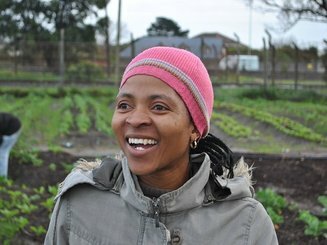 In spring 2013, Avalon started a six year project to introduce and professionalise organic urban farming in Cape Town. www.sosvillages.org.za ​is implementing various Family Strengthening Programmes (FSP) throughout the country, in which it supports disadvantaged families by bolstering their capacity to protect and care for their children. Growing food can serve both food security and income generation. Although the interest is there, so far resources have been lacking to provide proper training and startup facilities to reach even a stage of subsistence farming. Avalon and SOS SA have decided to work together in this project to build exactly this capacity among caregivers of different FSP’s. The second component of the project is a training towards semi-commercial farming which will further increase economic independence and will provide better income to the farmers. At the same time farmers will learn basic management skills and start selling surplus produce to the market. The target group for this training are farmers from existing subsistence farmers groups as well as the mentioned SOS group. In both components the local organisation Abalimi will play an important role as it will provide local training on the ground based on its well tested scheme. between 530 and 730 permanent jobs. ​The project is welcomed both by SOS SA, local authorities and others and may serve as an important example for replication in other countries as well.